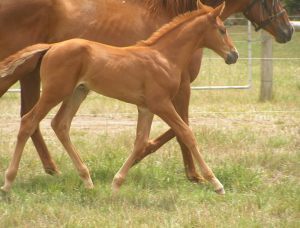 Maestro is one of the nicest foals that Waldarrah and Darraweit Park have bred. He has gorgeous uphill movement and an extremely trainable nature. As well as a rocking horse canter. 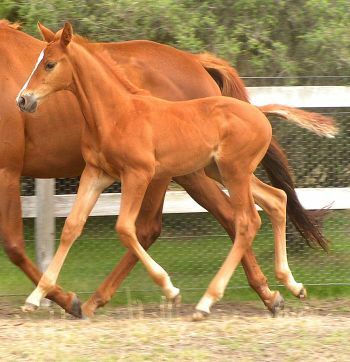 Maestro is by AJ Maximus (Son of Rituel) and out of DP Dolly who is a ASB mare by Dolphin Street. We wish Casey all the very best with this awesome little fellow and have no doubt that he has a bright future ahead of him. DP Maestro was bred in partnership with Darraweit Park. Wally as he is known here, is also by AJ Maximus, and out of my 15.1hh eventing mare, who is by Racers Edge. Wally is rising 4 this year and has an impeccable nature and an easy going temperament. He has 3 lovely paces and is destined to be an all round performance horse. We wish Karen all the very best on her purchase of Wally. I am sure he will do us both very proud. Ally is now a 3yo who is growing into a lovely young filly with exceptional movement and lovable temperament. Maddy and Ally 1/11/11. First time "jumping"